Village Urban Resort Hotel is a hotel located in Solihull, West Midlands, Enalgand, U.K. This photo was sent in by KD. 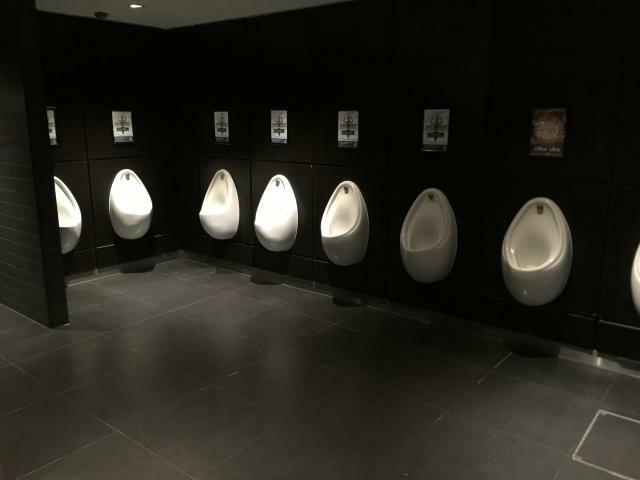 He writes: "Quite an ample supply of [urinals here] - 12 in all - and all nicely, individually spotlighted. They all auto-flush at the same time - there are sensors in the wall near the sinks (just behind where I was standing) that count the number of people coming in and out of the door and flush them accordingly. I found that a bit disturbing as well as wasteful, but that's how it is set up. Very cool when they do all flush at the same time, though - sounds like a small waterfall."